General Cage Replacement Silver metal dog crate pans fits the 30-inch General Cage Dog Crate. This dog crate replacement pan is silver galvanized steel. 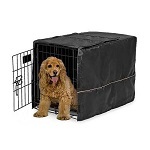 Dog Crate Pan Size: 20.5" x 29.5"
Metal Dog Crate Pan Depth: 1-1/4"
*Note: The metal dog crate replacement pan shown might be a slightly different shape from actual dog crate replacement pan. The image is to show you that you are purchasing a metal dog crate replacement tray. This dog crate replacement tray is designed to fit a General Cage 30-inch dog crate but the pan 'might' fit other brands. We can not guarantee this dog crate replacement tray will fit all crates so please be sure to check the measurement of the dog crate replacement pan.